Ceci n'est pas une Machine à explorer le temps! This list of René Magritte works was compiled from several auctions during the last years; mainly from Sotheby's and Christies. 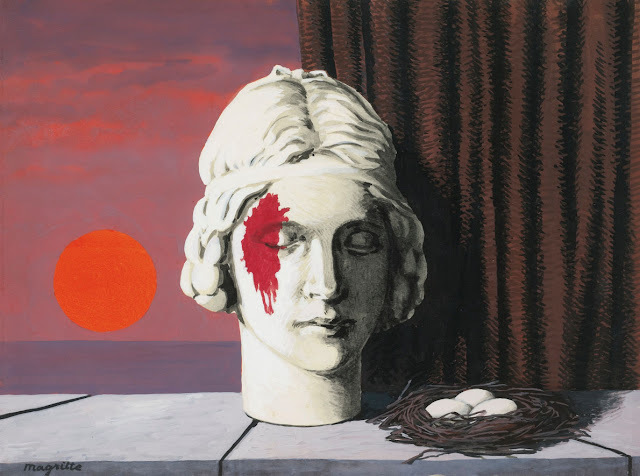 René François Ghislain Magritte (21 November 1898 – 15 August 1967) is perhaps the most famous surrealist artist. 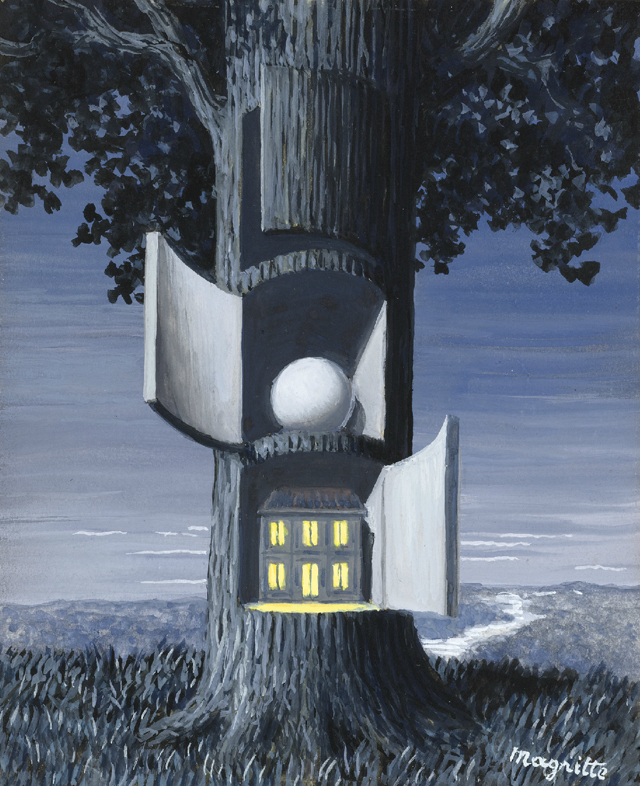 René Magritte was born in Lessines, in the province of Hainaut Belgium, in 1898, the eldest son of Leopold Magritte, who was a tailor and textile merchant, and Regina (nee Bertinchamps), a milliner until her marriage. 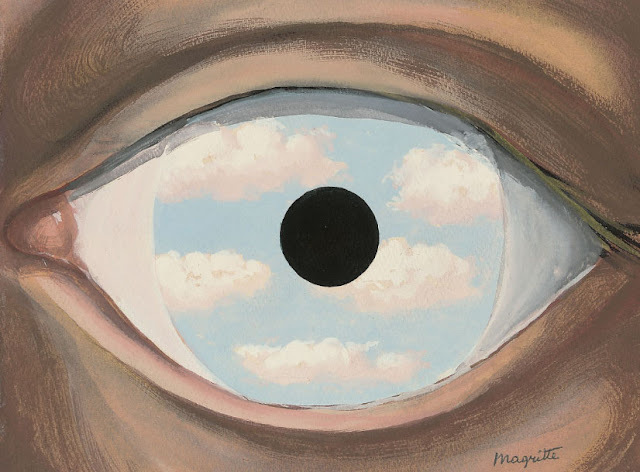 Little is known about René Magritte's early life. 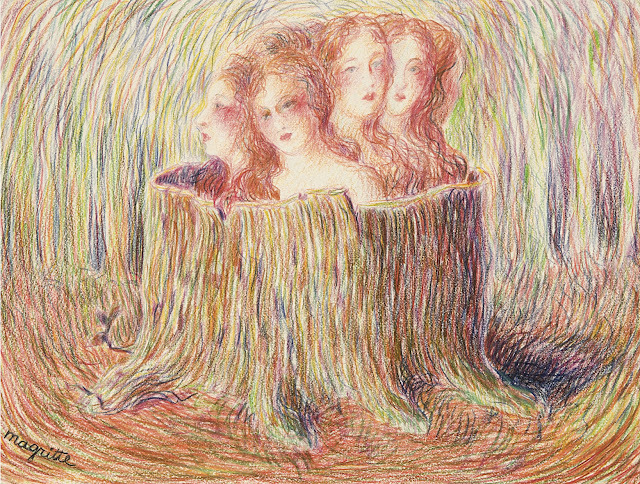 He began lessons in drawing in 1910. On 12 March 1912, his mother committed suicide by drowning herself in the River Sambre. This was not her first attempt; she had made many over a number of years, driving her husband Leopold to lock her into her bedroom. One day she escaped, and was missing for days. She was later discovered a mile or so down the nearby river, dead. 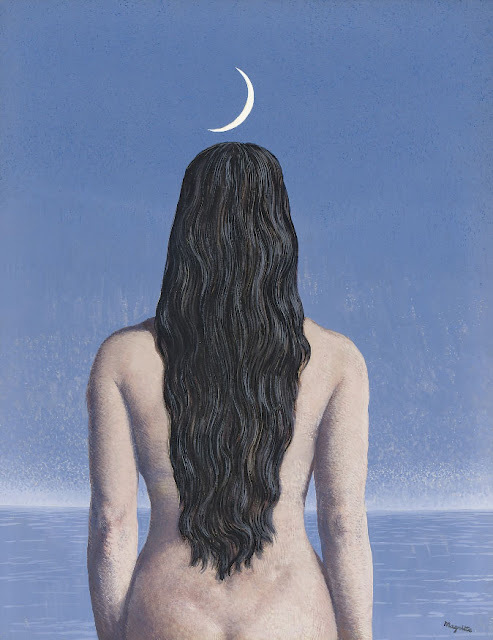 According to a legend, 13-year-old René Magritte was present when her body was retrieved from the water, but recent research has discredited this story, which may have originated with the family nurse. Supposedly, when his mother was found, her dress was covering her face, an image that has been suggested as the source of several oil paintings Magritte painted in 1927-1928 of people with cloth obscuring their faces, including Les Amants. 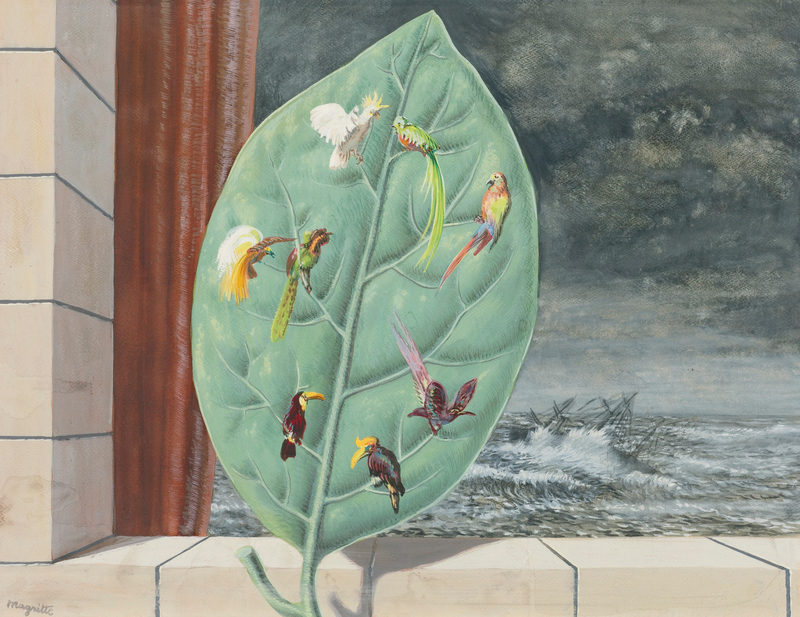 René Magritte's earliest oil paintings, which date from about 1915, were Impressionistic in style. From 1916 to 1918 he studied at the Academie Royale des Beaux-Arts in Brussels, under Constant Montald, but found the instruction uninspiring. The oil paintings he produced during the years 1918-1924 were influenced by Futurism and by the offshoot of Cubism practiced by Metzinger. Most of his works of this period are female nudes. 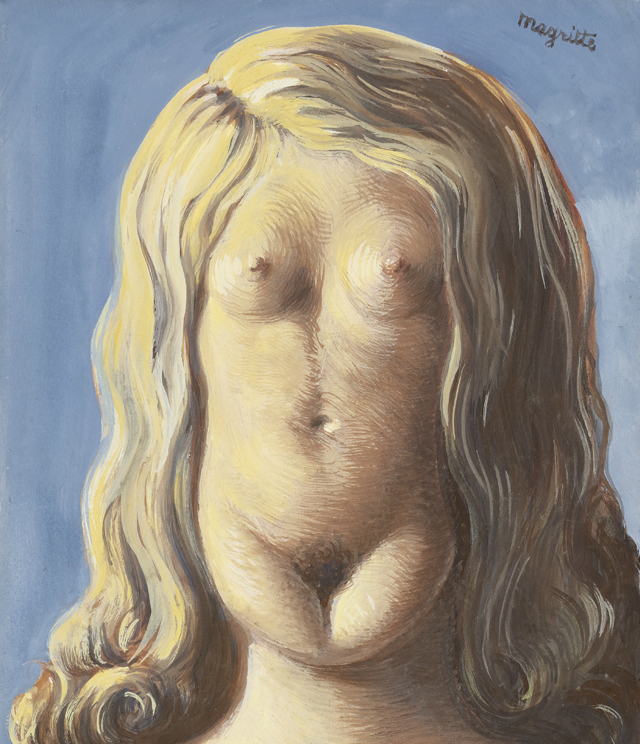 In 1922 René Magritte married Georgette Berger, whom he had met as a child in 1913. 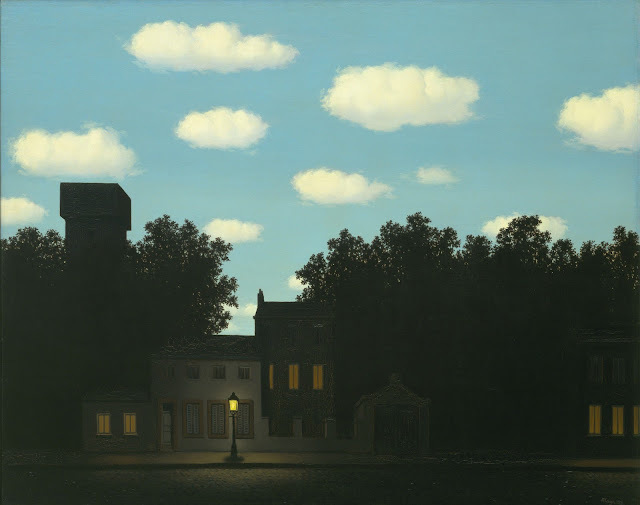 From December 1920 until September 1921, René Magritte served in the Belgian infantry in the Flemish town of Beverlo near Leopoldsburg. 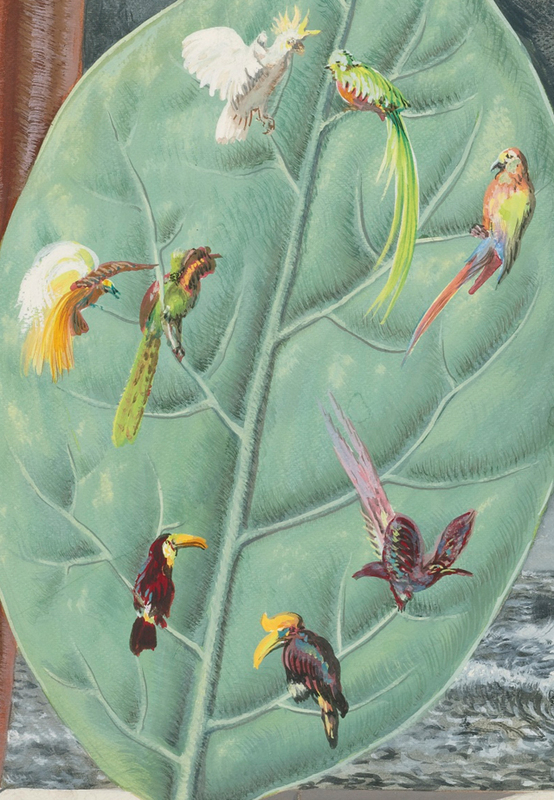 In 1922-1923, he worked as a draughtsman in a wallpaper factory, and was a poster and advertisement designer until 1926, when a contract with Galerie la Centaure in Brussels made it possible for him to paint full-time. 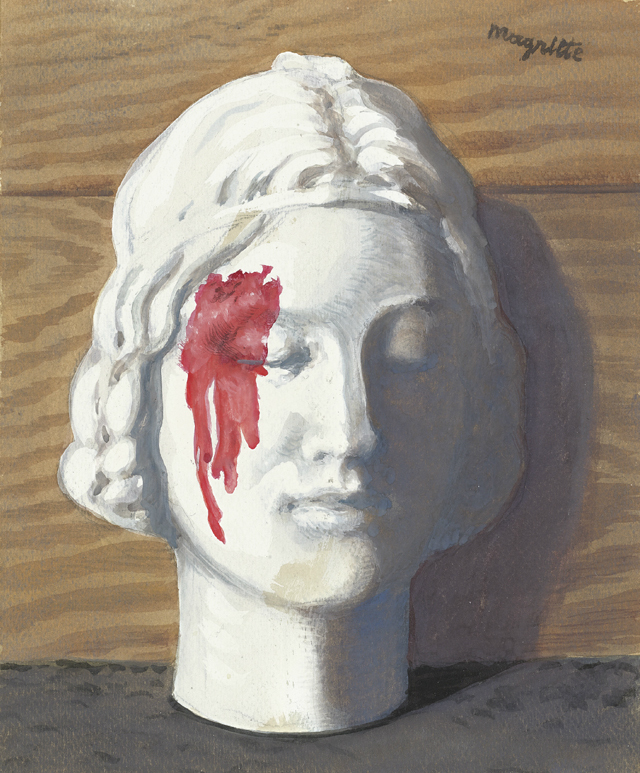 In 1926, René Magritte produced his first surreal oil painting, The Lost Jockey (Le jockey perdu), and held his first exhibition in Brussels in 1927. Critics heaped abuse on the exhibition. Depressed by the failure, he moved to Paris where he became friends with Andre Breton, and became involved in the surrealist group. Galerie la Centaure closed at the end of 1929, ending René Magritte's contract income. 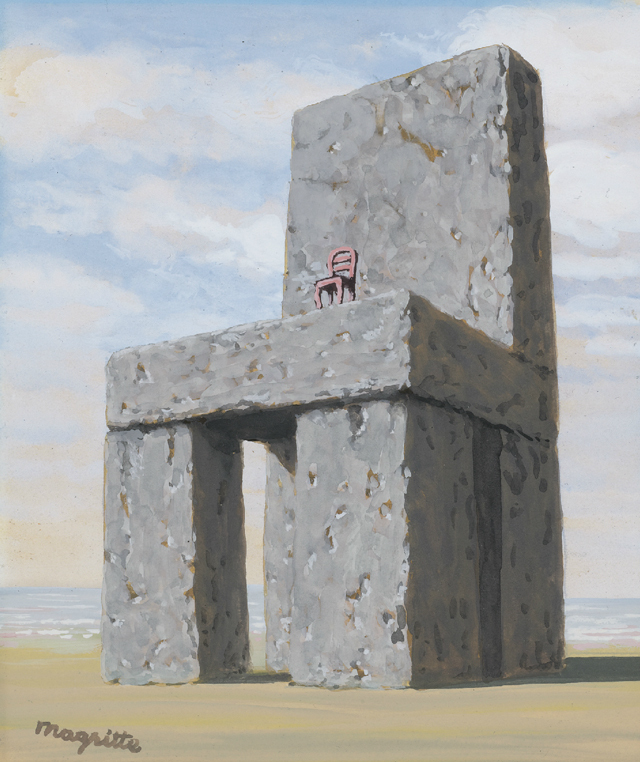 Having made little impact in Paris, Magritte returned to Brussels in 1930 and resumed working in advertising. He and his brother, Paul, formed an agency which earned him a living wage. 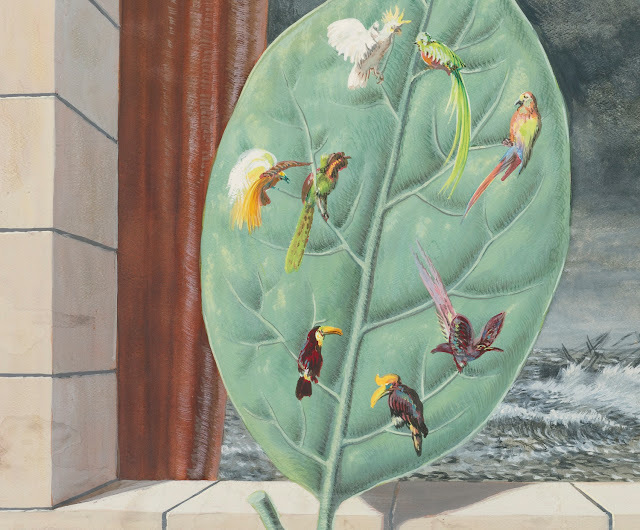 Surrealist patron Edward James allowed René Magritte, in the early stages of his career, to stay rent free in his London home and paint. 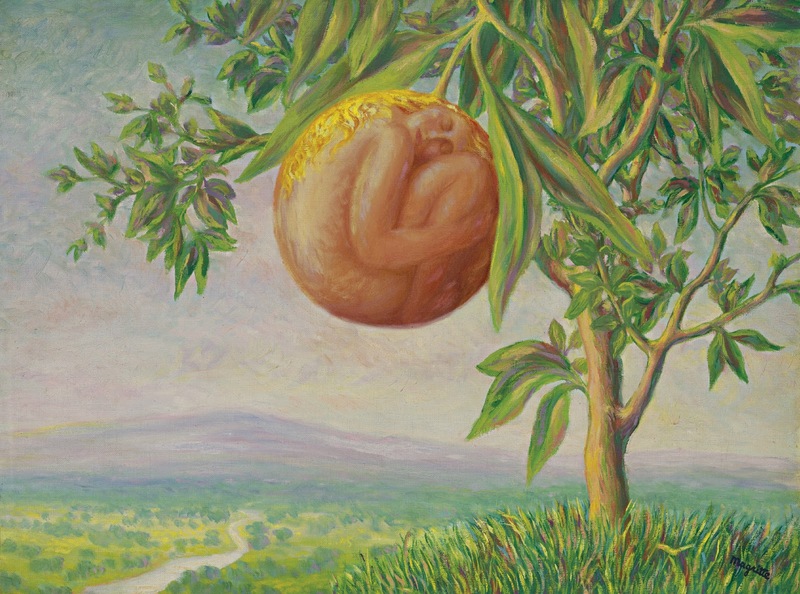 James is featured in two of Magritte's pieces, Le Principe du Plaisir (The Pleasure Principle) and La Reproduction Interdite, an oil painting also known as Not to be Reproduced. During the German occupation of Belgium in World War II he remained in Brussels, which led to a break with Breton. He briefly adopted a colorful, painterly style in 1943-44, an interlude known as his "Renoir Period", as a reaction to his feelings of alienation and abandonment that came with living in German occupied Belgium. 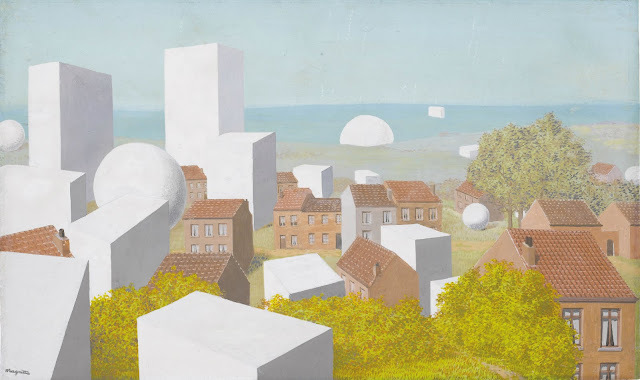 In 1946, renouncing the violence and pessimism of his earlier work, he joined several other Belgian artists in signing the manifesto Surrealism in Full Sunlight. 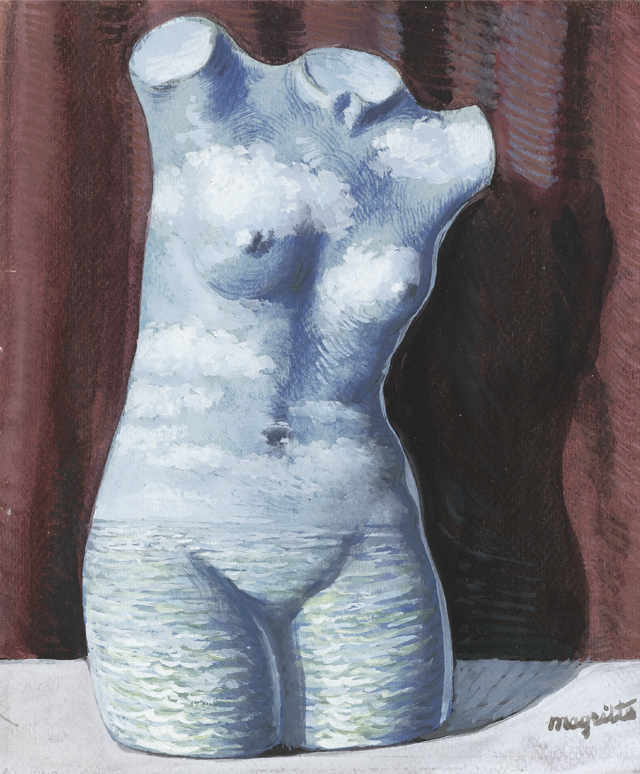 During 1947-48-Magritte's "Vache Period"-he painted in a provocative and crude Fauve style. 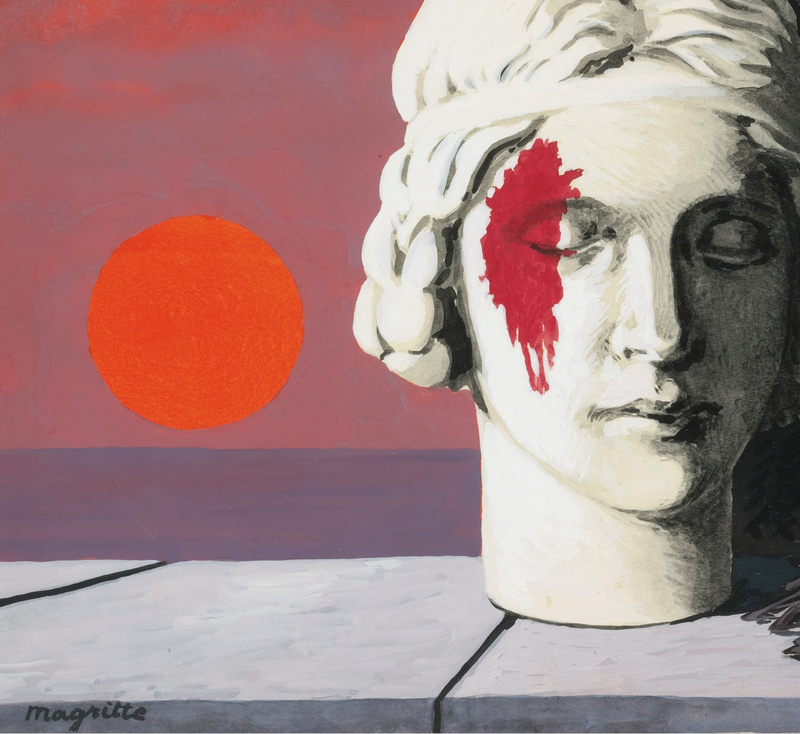 During this time, Magritte supported himself through the production of fake Picassos, Braques and Chiricos-a fraudulent repertoire he was later to expand into the printing of forged banknotes during the lean postwar period. 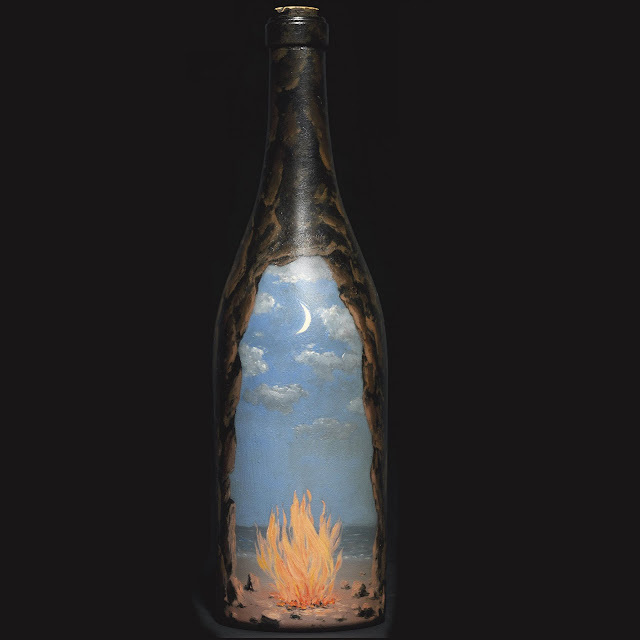 This venture was undertaken alongside his brother Paul Magritte and fellow Surrealist and 'surrogate son' Marcel Marien, to whom had fallen the task of selling the forgeries. At the end of 1948, he returned to the style and themes of his prewar surrealistic art. 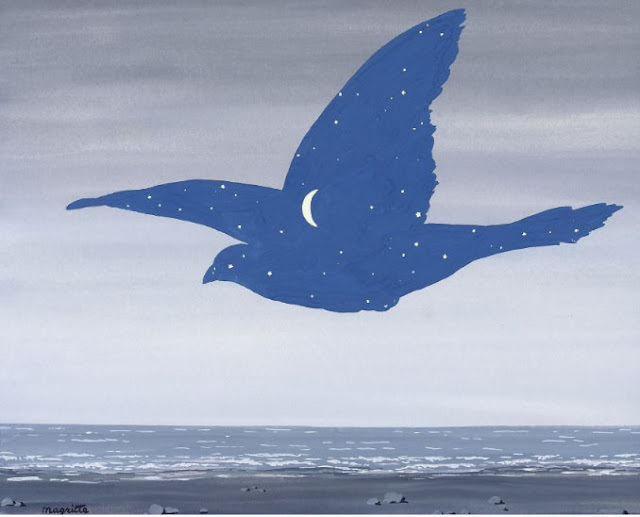 His work was exhibited in the United States in New York in 1936 and again in that city in two retrospective exhibitions, one at the Museum of Modern Art in 1965, and the other at the Metropolitan Museum of Art in 1992. 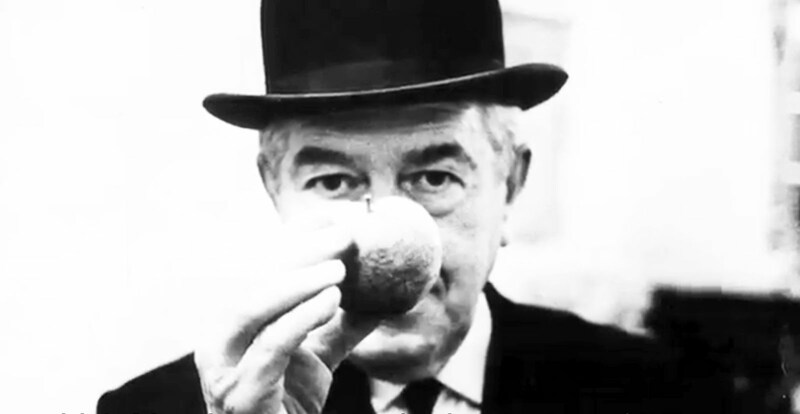 René Magritte died of pancreatic cancer on 15 August 1967 in his own bed, and was interred in Schaerbeek Cemetery, Evere, Brussels. 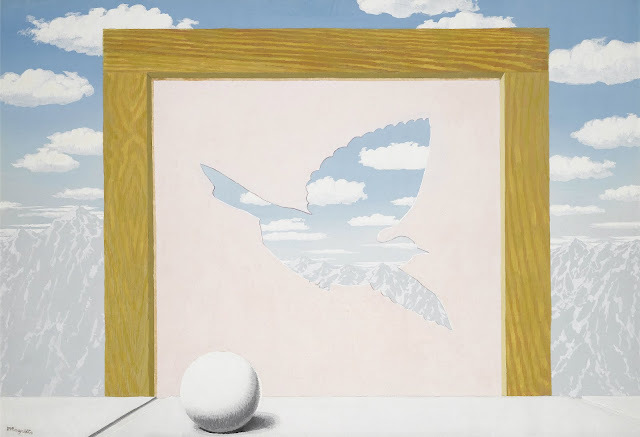 Popular interest in René Magritte's work rose considerably in the 1960s, and his imagery has influenced pop, minimalist and conceptual art. modern design interior is a modern design blog featuring modern design news on modern furniture, modern lighting, modern architecture and modern home decor. modern design interior is the premier modern design blog reporting on modern designs, modern designers, modern furniture, italian furniture, designer furniture, mid century modern design, space age design, fifties design, sixties design and seventies design, modern lighting, modern homes, modern architecture, modern architects, modern prefab, contemporary architecture, modern style, sixties fashion, mod fashion, modern art, modern home decor, modern interior design, modern home design, contemporary furniture, modern design ideas and much much more.